Work will commence in late April on a USD$54 million renovation of the Port Everglades cruise terminal in Fort Lauderdale following an agreement with Carnival Corporation. The renovations will commence on Cruise Terminals 2, 19, 21 and 26 in late April with completion slated from mid-December 2012 through to early June 2013. “Cruise ships are getting larger, so homeports such as Port Everglades must reconfigure and modernize their cruise terminals to accommodation arriving and debarking guests simultaneously to keep ships on schedule,” Port Everglades chief executive and port director Steven Cernak said. Two passenger loading bridges will be installed to allow for simultaneous embarking and debarking with separate and larger baggage halls, improved ground transportation and revamped artwork. Artists featured in cruise terminals 2, 19 and 26 were selected from a field of 208 applicants who were given the objective to promote tourism to South Florida and evoke a tropical vibe with artists using materials primarily sourced from Broward County and the broader South Florida region. Cruise Terminal 2 in the Northport section of Port Everglades will feature the ‘Starfish Shuffle’ by Miami artist Xavier Cortada with giant starfish suspended from the ceiling providing a reduction in ambient noise as well as suiting the tropical atmosphere desired. ‘Pelican Path’, also created by Cortada, is a 40-foot glass mosaic and ceramic mural that doubles as a directional sign for passengers to follow from ticketing to the waiting area. Cruise Terminal 19 will also feature directional art produced by Mark Fuller with schools of suspended multi-coloured acrylic fish guiding passengers through the terminal. The renovations are part of a landmark agreement finalized in April 2010 between Carnival Corporation and the Broward County Board of County Commissioners that calls for a minimum of 25.5 million cruise passengers from multiple Carnival Corporation brands calling in and out of Port Everglades over an initial 15-year term. 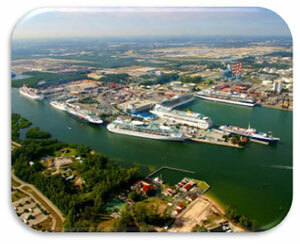 Almost USD$500 million in Port revenue is expected to be generated by the move. Originally published for e-Travel Blackboard.